Amid the roar of engines and the smell of diesel fuel, 30 students assemble on the asphalt preparing for a morning of road training in South Texas. 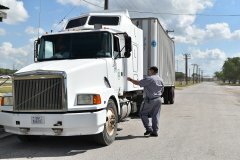 A student climbs into the cab of a Texas Department of Criminal Justice (TDCJ) 18-wheeler, reaches for a clipboard and begins his routine safety inspection. With thorough efficiency, the student driver embraces his responsibilities; this program could change his life. "The trucking industry is the backbone of the U.S. economy. Trucks moved more than 70-percent of all U.S. freight and generated $700 billion in revenue in 2017," Windham School District (WSD) instructor Jay Mann says. 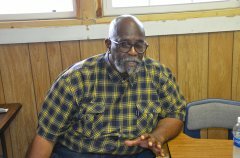 "Ex-offenders with truck driving experience are in demand, and they stand to earn an annual income ranging from $70,000 to $100,000. Businesses out there want to hire these guys; it's my job to make sure they get the best competitive training." 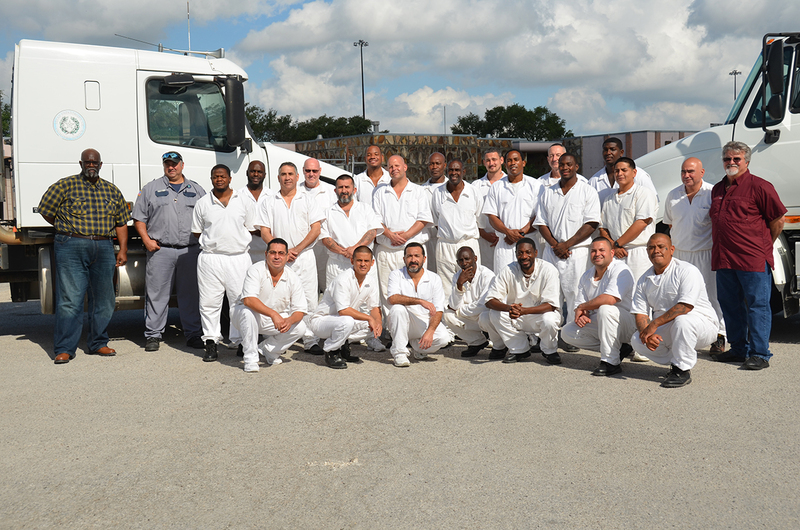 Located on a sprawling campus at the Garza Unit, the WSD Truck Driving Program has merged transportation and rehabilitation to bring offenders up to current employment standards since 1989. Under the guidance of WSD instructors Mann and Wade Jones, each student and prospective truck driver aims to receive a Commercial Drivers License (CDL). Before they take to the road, however, students are required to pass health examinations and rigorous Department of Motor Vehicle (DMV) screening. "We have to make sure students are physically fit and clear of all driving infringements before they can be issued a Commercial Learners Permit (CLP)," Jones says. "Then we can get them around a truck and on the road." The CLP is a preliminary phase which all beginning truck drivers must experience. Program training lasts 600 hours or possibly longer — depending on testing schedules, changing requirements at the Department of Transportation (DOT), or even student needs. Instruction is divided between a traditional classroom setting and practice driving at the on-site road course in and near the Garza Unit. Students are always ready to work outside with the trucks, but most lessons begin in class. "Classroom curriculum involves textbook instruction with supplemental computer and video research, covering vital subjects such as comprehensive vehicle operation and maintenance, oil and water servicing, lamplight and turn signal efficiency, engine performance and safety protocols," Jones says. Learning vehicle safety is the most important lesson for potential truck drivers, and program instructors instill this rule from day one. "Safety for oneself and for other drivers must be the foremost thought in the driver's mind at all times," instructor Mann stresses. Students also learn about terrain types, structural strength of vehicle categories, and the importance of the cargo weight-balance ratio. The reiteration of safety and vehicle familiarity is a measure that ultimately can save lives. "In this program, we learn to go above and beyond being safe; vigilance is what prevents breakdowns, or worse, a crash caused by some defect," student driver Fuentes says. Students are tested on their knowledge of safety and driving skills and, most importantly, to see if their level of comprehension meets strict local, state, and national guidelines. If their examination scores are high enough, students are given road assignments. "All practice driving permitted at this early challenge is monitored carefully, and either myself or Mr. Mann will ride in the front seat with the students at all times, evaluating their performance every step of the way. Miles are recorded, catalogued, and reviewed by instructors and potential employers on the outside," Jones says. Formal training is still the most reliable way to build travel awareness and learn the specialized skills required for safely driving a large commercial vehicle and becoming a professional driver in the trucking industry. The offenders' practice driving course at Garza, which is a decommissioned military base, contains actual obstacles and situations students must efficiently pass through: intersections with stop signs, slowing cars, and traffic pulling out in front of the vehicles. "Students drive around the practice yard, performing maneuvers like hitching and unhitching trailers, relocating trailers from one dock to another, making turns, backing-up, and parking. The next step is to go out on the road as a driver's helper. This allows them to get practical experience in highway and city driving," Jones says. Before the offender driver starts a trip, he must go through his safety check list, making sure the gas tank and the oil are full and inspecting the tires, wheels, rims, brakes, lights, reflectors, electrical connections, trailer coupling devices and cargo securement. Students work with partners to complete the critical tasks. "We check, recheck, and check again until we know for sure that the vehicle is safe and fit for the road," says student D. Scott. Along with safety strategies, classes discuss career options for truckers. The trucking industry employs many kinds of workers besides drivers. Dispatchers direct trucks to the proper destination with the correct cargo, while freight handlers and loading-dock and warehouse workers load and unload trucks. Mechanics repair and maintain trucks, and office workers such as shipping clerks and computer programmers are also essential to the industry. 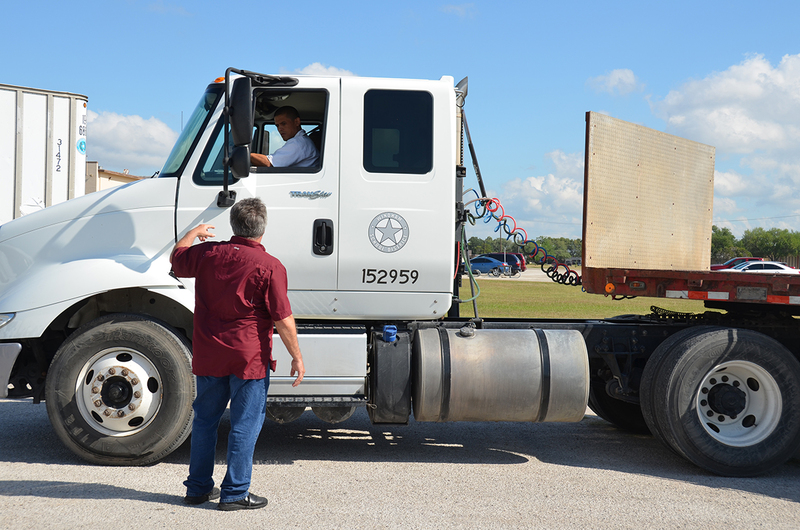 Training is also given for the job of a unit dispatcher, which is the heart of this instructional partnership of the Texas Department of Criminal Justice (TDCJ) and the WSD Truck Driving Program. "A TDCJ dispatcher officer assigns each driver his route trajectory and, if necessary, the load manifest. He also decides what time the truck will leave. This correctional officer knows where each offender driver is at all times, on or off-road. They know who is coming in and who is going out. They know how long it should take each truck to arrive at the destination. The important thing is that the freight and the cargo get to the right place, safely and quickly," Jones says. Transporting cargo is very important and an area of extreme concern for safety. Cargo which is improperly unloaded or not secured can become a danger. Loose cargo can cause traffic problems, and vehicles can be damaged by overloads. Steering can also be affected, and hazardous material can splash and cause contamination. The TDCJ utilizes trucks for many reasons and strives to maintain the highest level of safety and security procedures in trucking operations. "Trucks play a major role in the day-to-day operations of the TDCJ in industrial, agricultural, and logistical use. They transport everything an offender eats, wear, and buys from the commissary," Jones says. According to the Houston Chronicle, the trucking industry is experiencing a shortage of drivers across the nation ("Truck Driver Shortage Constrains Booming Texas Oil Fields, U.S. economy," Aug. 31, 2018). Texas alone needs at least 50,000 more drivers, said John Esparza, president of the Texas Trucking Association, who was quoted in the Chronicle. 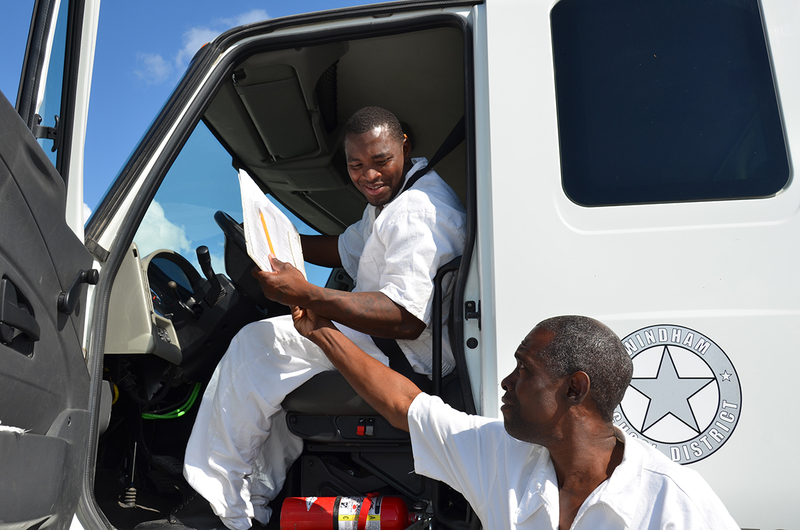 WSD truck driving instructors are ensuring students will not miss out on the abundant employment opportunities. To help better prepare offenders for future employment, training in this program includes soft skills, such as interacting properly with other trucking professionals and law enforcement. "We have to learn how to conduct ourselves responsibly, because if an emergency situation occurs, interaction with law enforcement, DOT or DMV personnel becomes imperative," says offender K. Kyle, a program participant. The program also teaches offenders how to interact with fellow students and future coworkers. "Peer teamwork is what makes this program work," participant D. Gibson says. "Everybody here helped others with driving and studying. Some of the offenders had hang-ups about dealing with other offenders, but we leaned how to break down those barriers. We study together back at the dorm living area, and when we see someone falling short or lagging behind, we always try to lift up that person." "It's a challenge to get up at 4 a.m. each morning, training, studying, and driving, day-in and day-out. But no matter how difficult it seems, we are all anxious to do it all over again the next day. We want to get back in the classroom or into a truck, and help each other learn," offender Kyle says. Teamwork is changing the way the students interact with one another: "Before, we looked at each other and saw nothing special, but now we see one another with new respect and admiration," says teacher's aide A. Rodriguez. "I didn't just learn how to drive an 18-wheeler in this program; I also learned self-respect, the value of integrity, and how to help and understand others." Instructor Jones challenges students to be successful now and in the future. "The program is only as strong as its weakest link, so don't let the weakest link be you," he tells them. "That is where class camaraderie comes in. The purpose of the WSD Truck Driving Program is to teach workplace skills, change lives, rearrange offender thoughts and behaviors, and prepare participants for a successful career and future. I tip my hat to these guys, because they are achieving their goals. They are driving toward success."